Artificial intelligence (AI) has long been the stuff of summer blockbusters and comic books. But in the past few years, real-world research projects on AI have flourished. Advances in computer science are turning the hype of science fiction into hope for doctors and patients. In the field of cancer imaging, radiologists are looking forward to a new generation of computer programs that can be taught to recognize tumors automatically. With the introduction of CT scanning in the 1970s and MRI machines in the 1980s, some people expected those technologies to eliminate the need for radiologists. Instead, the field of radiology grew even more vital to modern health care. Lead researchers expect AI to further empower radiologists. By taking care of monotonous, time-consuming tasks, AI would allow specialists to focus on decision-making. Projects are underway to develop software that can detect and measure many types of cancer. This includes a project in Scotland aimed at improving mesothelioma treatment. Medical researchers give mesothelioma much less attention than more common diseases such as breast and lung cancer. Fortunately for mesothelioma patients, the scope of cancer-imaging AI has grown. It is wide enough now to put even rare cancers in its crosshairs. 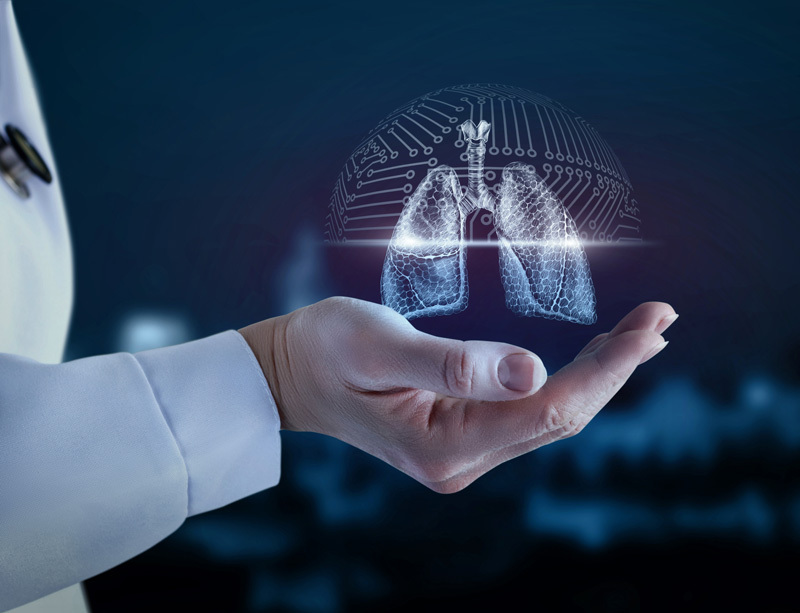 Researchers around the world are developing AI tools to detect early-stage lung, breast, pancreatic and colorectal cancer. The common aim of these projects is to catch cancer before it spreads, when doctors have the best chance to eliminate it from the body. One team’s software can differentiate between skin tumors and benign moles more accurately than human dermatologists. Another group’s program can demarcate head and neck cancer tumors, which form in notoriously tricky locations. Mesothelioma tumors are also notoriously hard to find and measure. They typically grow along the thin membrane lining the outside of the lungs, called the pleura. On an imaging scan, it is often difficult for a radiologist to tell where healthy pleural tissue ends and tumors begin. AI researchers have risen to the challenge. Canon Medical has been designing diagnostic imaging equipment for more than 100 years. The firm began in the early days of X-ray technology and remained an industry leader during the revolutions in CT scanning and MRI technology. Now Canon Medical’s European Research division has partnered with mesothelioma specialist Dr. Kevin Blyth of the U.K. National Health Service. In August 2018, the project was awarded about $180,000 by the Scottish Funding Council as part of its Cancer Innovation Challenge. While mesothelioma is rare compared to other diseases, it has great local significance. Extensive use of asbestos in the 20th century has left Scotland with some of the highest rates of mesothelioma in the world. AI technology could improve imaging practices and cancer treatment in several ways. An AI program could quickly search through a patient’s medical records and pull in all relevant information. This will help ensure the radiologist does not overlook an important factor in the patient’s medical history, treatment plan or lab results. The program could also highlight previous scans of the same body area for a side-by-side comparison. Doctors may order imaging scans for any number of reasons. Sometimes doctors catch early-stage cancer by accident while looking for something else. However, often doctors will not notice cancer on a scan unless they are looking for it. An AI program could check every single scan for signs of cancer, and it could also check all existing scans in hospital records. By taking most of the human labor out of cancer screening, it would be much easier to catch early-stage cancer in routine scans. AI programs are better than humans at noticing differences in texture that can indicate cancerous tissue. These textural differences can be so subtle that they are effectively invisible to the human eye. Radiologists spend an enormous amount of time staring at scan after scan and typing meticulous reports. This leads to fatigue, which increases the risk of human error. It is also the reason patients have to wait days or weeks to get imaging results. An AI program could take care of the more monotonous aspects of the work, identifying and reporting abnormal scans automatically. This would leave radiologists with more energy for decision-making, and it would allow them to work much faster. To determine whether a treatment is working, doctors have to measure whether a tumor is shrinking, growing or staying the same size. An AI program could measure tumor volume quickly and accurately, making it much easier to judge the success of a therapy. This will enable patients to be better-informed when they make decisions to start or stop a treatment. It will also make clinical trials more cost-effective so new treatments are cheaper to develop. Artificial intelligence is a broad term that encompasses many technologies and theories. Medical-imaging AI programs use a machine-learning technique based on neural networks. Computer programmers cannot write instructions for how to identify cancer — the task is much too complex. Instead, a neural network learns by looking at hundreds or even thousands of example images where the cancer has already been marked by an expert radiologist. With this approach, an AI program will be only as intelligent as the humans that trained it. But once the AI program is trained, it can perform the task much faster than a human, and it will never get tired. Machine-learning technology already drives Facebook’s facial-recognition algorithm and Google’s image-search feature. Researchers are also using neural networks to teach self-driving cars how to see what’s on the road in front of them. If radiology research keeps up its current pace, however, AI cancer-scanning tools may beat self-driving cars to the market. People with mesothelioma and other cancers stand to benefit from artificial intelligence’s success. University of Central Florida. (2018, Aug. 22). Engineers develop artificial intelligence system to detect often-missed cancer tumors. Paterson, K. (2018, Aug. 7). Edinburgh tech firm to tackle ‘asbestos cancer' mesothelioma. Symon, K. (2018, Aug. 7). Canon Medical Research awarded £140k to develop AI cancer assessment prototype. Kent, J. (2018, Aug. 3). How Artificial Intelligence is Changing Radiology, Pathology. Tucker, I. (2018, Jun. 10). AI cancer detectors. Harris, R. (2018, May 30). For Some Hard-To-Find Tumors, Doctors See Promise In Artificial Intelligence. Dargan, R. (2018, Apr. 2). Machine Learning is the Next Chapter of Radiology, Not the Last. Marr, B. (2017, May 16). How AI And Deep Learning Are Now Used To Diagnose Cancer.